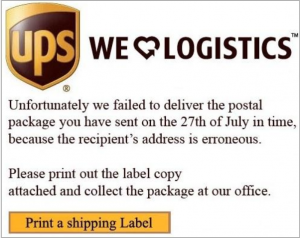 This was actually a fairly bad image – but frequently we see AT&T bills and UPS and Fed Ex spam that is very convincing visually! The poison in the page is copy that would not do any good if added to a spam learning system. .Oh, no, worse than the sin! as the honest cynic says. We will go down to Madame von Rudiger, and she shall make acquaintance with the man who claims her daughters hand. She could almost have said: Know me better; and she would, sincere as her passion in its shallow vessel was, have been moved to say it for a warning while yet there was time to leave the house instead of turning into that room, had not a remainder of her first exaltation (rapidly degenerating to desperation) inspired her with the thought of her being a part of this handsome, undaunted, triumph-flashing man. Men and women alike, who renounce their own individuality by cowering thus abjectly under some other before the storm, are in reality abjuring their idea of that other, and offering themselves up to the genius of Power in whatsoever direction it may chance to be manifested, in whatsoever person. We no sooner shut our eyes than we consent to be prey, we lose the soul of electio! n. Mark her as she proceeds. All in the Middle City stood the Temples of the citys priests, and hither came all the people of Mlideen to bring them gifts, and there it was the wont of the Citys priests to carve them gods for Mlideen.For in a room apart in the Temple of Eld in the midst of the temples that stood in the Middle City of Mlideen there lay a book called the Book of Beautiful Devices, writ in a language that no man may read and writ long ago, telling how a man may make for himself gods that shall neither rage nor seek revenge against a little people. And ever the priests came forth from reading in the Book of Beautiful Devices and ever they sought to make benignant gods, and all the gods that they made were different from each other, only their eyes turned all upon Mlideen. But upon Mowrah Nawut for all of the forgotten years the gods had waited and forborne until the people of Mlideen should have carven one hundred gods. Do they not constitute the immense difference between the love and the intrigue?All things that savour of youth make our most exquisite sensations, whether to experience, or recall:–thus, in the seasons of the year, we prize the spring; and in the effusions of the heart, the courtship. Beautiful, too, and tender–wild and fresh in her tenderness–as Lucilla was, there was that in her character, in addition to her want of education, which did not wholly accord with Godolphins preconception of the being his fancy had conjured up. His calm and profound nature desired one in whom he could not only confide, but, as it were, repose. Thus one great charm that had attracted him to Constance was the evenness and smoothness of her temper. But the self-formed mind of Lucilla was ever in a bright, and to him a wearying, agitation;–tears and smiles perpetually chased each other.